The Wednesday Hodgepodge always feels like ‘home’ to me. It’s a place for old friends to gather each week, and it’s also a great place to make new friends. The Hodgepodge is a place to share our innermost thoughts on subjects, then compare them with the thoughts of others, and it’s a place to give and receive encouragement! I’m grateful to our hostess, Joyce, for starting and, more importantly, continuing to host The Wednesday Hodgepodge. Welcome to my Wednesday home! 1. When I look at the sky I feel a lot of different emotions. For instance, if the sky is bright and blue, I usually feel happy and hopeful… If the sky is blue with lots of puffy white clouds, then sometimes I feel nostalgic (remembering distant days of looking for the shapes in those clouds with my young children…). If the sky is dark and angry-looking, I feel nervous, wondering if we’ll be getting another damaging storm… Then, of course, there are days when just I look up at the sky and think about God, Heaven, loved ones who have already passed away, and loved ones who will pass away in the future. At those times, I feel a mixture of many emotions all at once. If I had to run for a political office, I’d run for the presidency (if I could), because I don’t think I could mess things up [for our country] any worse than they already are! That being said, I have no desire to run for any political office of any kind. The smell of food cooking on the stove. Nothing says ‘home’ like good smells coming from the kitchen. 4. How often do you take a step back to think about where you’re headed in life? Do you need more or less self-reflection? At this point in my life, I often think about where I’m headed in life. I know I’m living in the final season of my life. I’ve watched my parents live through theirs, and Ed’s parents live through theirs. I don’t know what twists and turns the final leg of my journey will take, but I know how the story ultimately ends. I don’t want to spend too much time thinking about the past or the future though, because I might miss something good that’s going on in the present! 5. July is National Ice Cream Month…besides a cone, what’s your favorite food item to top with ice cream? Hot fudge cake or warm apple pie– and I’m drooling just thinking about it because I haven’t had either one in a long time. How about–Bad Beginnings Can Have Happy Endings —because I didn’t always have a good childhood, but life’s been wonderful since I became an adult. We have a neighbour who walks every day as well. We can clock him. I said hot fudge cake too. I like your answer for the sky too. I bet The Walking Man is pretty healthy if he does all that walking. If I were going to do a lot of walking, I would think that The Village every day would be an awesome place to do it! I love your Hodgepodge Post Title, wish I’d thought of that one : ) The sky can make me feel a bit nostalgic too, particularly in the fall. Actually fall itself makes me nostalgic. I’ll vote for you if you run for President. 🙂 And just think of all the taxpayer airfare and taxpayer hotels you’ll get and can fly anywhere – and all the golfing you’ll get to do! I still love to look for faces or animals in the clouds. That’s right, we can’t possibly make things worse if we were president! I wrote several different answers for transportation and I did say bicycle but then changed my answer. Sorry about your chronic issues, I can’t believe they haven’t found a solution. My father use to walk like that and if you start walking in your sixties you can cut the chances of getting Alzheimer’s in half! I keep saying I need to start……. Your walker (and naming him) made me chuckle! 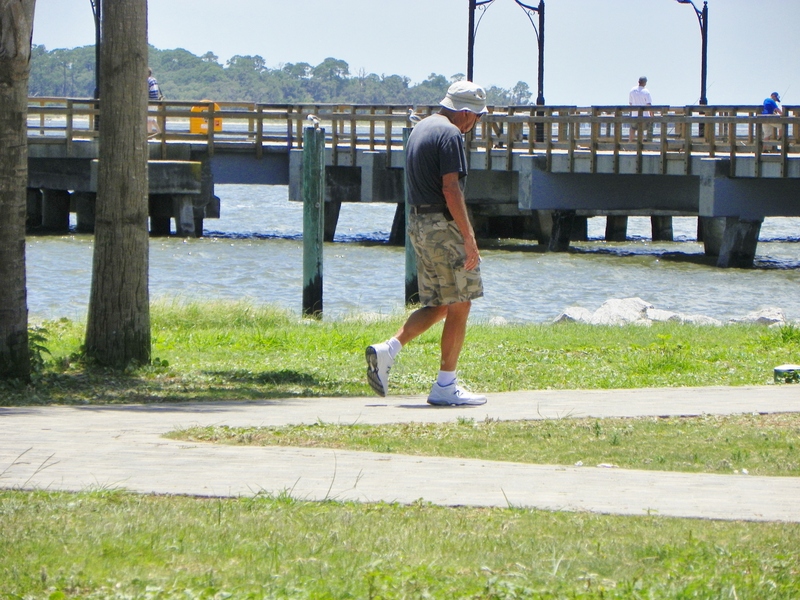 On my way to work each morning, I see the same “regulars” who walk Lake Hollingsworth at the same time I am driving by. I have given them names, too: Headband man; skirt lady; poodle lady; salt & pepper; socks… you get the idea! I thought I was the only one who did something like that! I feel a lot more normal now! Teehee! I always enjoy the Hodgepodge and comparing answers! Where i grew up we had an older man who would claim he’d walk 6 or 7 miles a day. Not sure i believed that though but he was a nice gentleman and would say hello to me and my dog every morning, I was so heartbroken when he passed. Thanks for your nice comment. I am so frustrated about the tomato situation. Maybe next year I’ll move them outside the garden and lay down black plastic and as soon as I’ve planted them, cover the black plastic with straw. I’ve got to have tomatoes to can. Thanks for telling me about your container gardening experience. We won’t do that then, and I’m kinda glad because that would have been pretty expensive and not a good return. Bicycle- that’s a good one! I used to get those hot fudge cakes at Shoney’s. That was WAY back in the day. Those things were good!